The minute I woke up this morning I knew something was terribly wrong. Seven cups of coffee didn't help, and four more didn't help, and the pot I made after that made my head feel like a balloon, which helped a lot. I do some of my best thinking when my head is extra large, which is reason enough to have a professional grade, cafeteria-size coffeemaker in my bedroom. But that isn't really the point. The point I wanted to make has more to do with the feeling of heaviness this morning. After my second pot of coffee, I decided to get out of bed and have a look around. That's when I noticed the clock on the kitchen stove, and the one on the wall, and all three clocks in the bathroom. I noticed the rest of them, too, but that doesn't really matter because I stopped putting gas in them a long time ago, so they just sit there. There's only one clock I can really trust, and that's the little "atomic" clock on my nightstand. I put the word in quotes because it isn't really atomic, which is a comfort to me when I think about how many nuclear missiles the Mexican government has pointed in my direction. 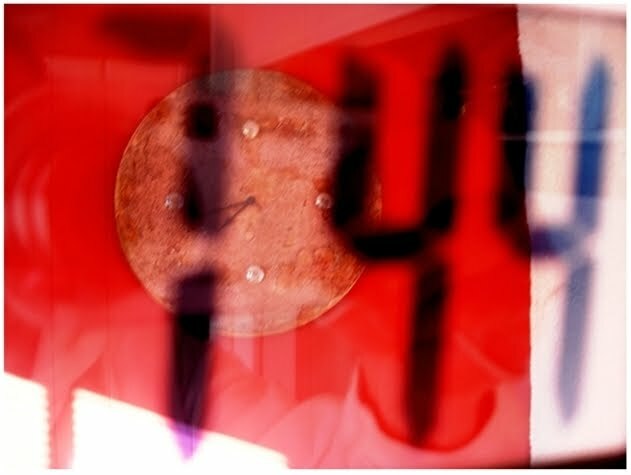 I have absolute trust in my "atomic" clock because its weight never varies, which has to do with spring-loaded inertial mechanisms far too complicated to understand. Anyway, after carefully weighing every clock in the place—using my "atomic" clock as a reference—I realized that exactly one hour had landed on top of preexisting hours, most likely at some point during the night, and probably for reasons having nothing to do with the flipping action of our planet's magnetic field due to recent lunar flares. The dispatcher at the local police department seemed confused about the reason for my call, and most of my neighbors thought I might have eaten too much Halloween candy, although a few offered more. Then the light came on. Of course! All those little goblins scratching at my window last night had simultaneously gorged themselves with the spoils of their crusade, mouthful after mouthful of sugary treats stuffed into their mouths until, at exactly 2:00 this morning, they had all ballooned at once, creating exactly the sort of gravitational trampoline that frightened Einstein and made him cry. This had left Mother Nature no choice. She had called Father Time, threatening to go to the media with certain details of past relationships if he didn't do something, immediately and without hesitation. He had, of course, but having severely underestimated the accumulated gravity of time as he shoveled minutes and seconds into the hole behind his cabin, the resulting time-pile had overwhelmed the capacity of the outhouse, leaving only one possible outcome. Flies. Lots and lots of flies. Time may be money to some, but to others it's nothing but flies, and who needs all that pesky buzzing, anyway? Not me. Thanks Craig, and I agree completely with your Griffith assessment. When it comes to time, they're hard to beat.